Southwest Missouri is hot and humid in the summer, prone to drought, can experience extreme cold in the winter, and is home to vast amounts of native, endophyte-infected tall fescue. Nevertheless, its rolling hills are well suited for pasture-driven agriculture; that’s why the New Zealand-based Grasslands Group decided to hitch their horse to the region in 2005 after looking at several other countries and U.S. states. “It was more difficult than we anticipated to devise a farm system that accommodates the variation in weather that we get in Missouri,” notes Gareth van der Heyden, chief executive of the Grasslands Group. New Zealand has a more moderate climate. After 10 years of trial and error, Grasslands now operates 12 separate, seasonal dairy units comprising 10,800 acres in the region. There are also six corn blocks for grain and silage production and two young stock support units. The backbone of the enterprise is the establishment and maintenance of high-quality permanent pasture for the 7,000 milking cows. “Our goal is to replicate a simple farming system across multiple farm units. To do that, we need consistent production of high-quality forage,” notes van der Heyden. The consistent production at Grasslands comes primarily from perennial ryegrass, though two of the farms are 60 percent soft leaf tall fescue (BarOptima PLUS E34). “There was a lot of trial and error finding varieties that were best for this region and system,” says van der Heyden. “We finally settled on Remington and Albion perennial ryegrass.” Each seems to persist through the less than tropical Missouri winters. If the need arises to establish grass following an existing grass pasture, Grasslands uses one or two applications of glyphosate to ensure a good kill of existing grass. Then two passes with a no-till drill are made, with the second pass perpendicular or diagonal to the first. 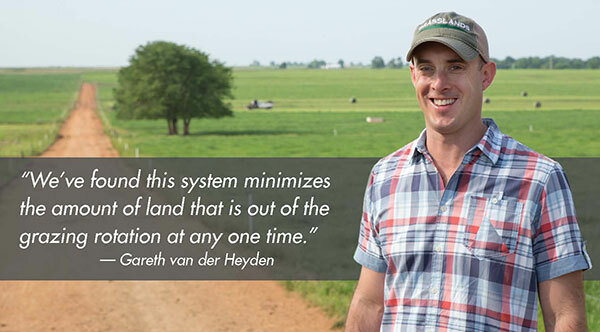 Van der Heyden actually prefers air-seeding pastures followed by rolling the seedbed. The downside, he states, is that cultivation is needed before seeding. “Establishing a dense pasture is important. We’ve found a 7-inch seed spacing is too wide and allows for weed invasion. Cross-seeding helps, but a drill with a 3.5-inch seed spacing would be more ideal,” opines van der Heyden. Being seasonal, cows are dry during much of December and January. Grasslands targets an average of 2,200 pounds per acre for pasture cover going into winter. As cows start calving in late January and early February, the “winter-saved” forage is grazed to 1,400 pounds per acre of residual. Once the perennial ryegrass begins to grow in the spring, pregrazing residuals are targeted at 2,500 pounds per acre and postresiduals at 1,400 to 1,500 pounds. Daily access to new pasture is gauged such that the postresidual is uniform, eliminating the need for mechanical topping. “Grazing to a consistent, even residual means cows can be offered quality feed at each grazing. That translates to more energy in and more milk out,” says van der Heyden. Tall fescue pastures are managed in much the same way as the perennial ryegrass with pregraze residuals of 2,100 to 2,200 pounds per acre and postgraze levels of 1,550 pounds. Farm managers on the dozen Grasslands’ farms do weekly farm walks to measure the amount of grass in each field. Van der Heyden cites this as one of the most important jobs on the farm. Visual assessments are entered into a database that calculates the “grass wedge” and average growth rates of pasture grasses. This information is then used to make cow movement and feeding decisions. Grazing management — knowing when to move cows — is only part of the equation for keeping productive pastures at Grasslands. Agronomy comes into play as well. “We ensure that our phosphorus, potassium, and sulfur levels are adequate and make sure pastures receive enough nitrogen to support a dense growth habit,” says van der Heyden. For Grasslands, that means four to five applications of about 35 pounds of nitrogen per acre during early spring and summer. Additional nitrogen is applied in the fall. Wastewater effluent from the milking facility is also utilized as a nutrient source. Like most farms, a nutrient management plan is in place to ensure against overapplication of nutrients. Though grass comprises the backbone of pasture feed at Grasslands, van der Heyden says they are starting to seed white clover where new pastures are established using cultivation and air seeding. In some cases, clover seed is also added to the early spring fertilizer application. This article appeared in the August/September issue of Hay & Forage Grower on page 20.